The inspiration for this painting was probably provided by the expedition to the North Pole around 1820 by the English explorer Edward William Parry, an attempt to discover a north-west passage. Numerous sketches prove that Friedrich studied ice drifts on the River Elbe in 1821, in order to understand how ice floes pile up into interlocking layers. The interpretation of the painting goes far beyond the depiction of a mere disaster at sea; contrary to an earlier, religious interpretation, recent opinion considers a political interpretation to be more likely. 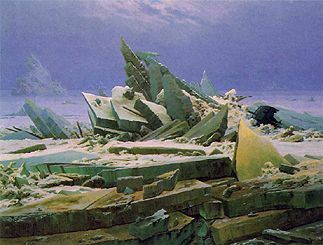 It is now thought that the sea of ice symbolizes the despondent mood which prevailed when, following the wars of independence against Napoleon, the much hoped-for political freedom from the ruling princes failed to be achieved. The cold political landscape during the "Vormärz" period, the result of a resolution passed at the Vienna Congress in 1815 to suppress all endeavours towards political freedom, led to to a "frozen" climate, particulary in Germany after 1819. The stacked tower of ice floes, a colossal presence compared to the almost-sunken ship "frustrated hope" forms a plaintive memorial in the blue-grey icy wasteland. Above this scene, however, the sky is beginning to clear. (1774-1840), an important Romantic landscape painter, was born in 1774 in Greifwald. He studied at the Academy in Copenhagen from 1794-98, and lived thereafter in Dresden until his death in 1840. "Wanderer above the Sea of Fog" (above) is one of his most famous pictures. Here is another "Eismeer": it's the front cover of Christoph Ransmayr's "Die Schrecken des Eises und der Finsternis", Dutch translation.